First up is Nadine Jarvis. Nadine started the year by examining the concept and word ‘zero’. 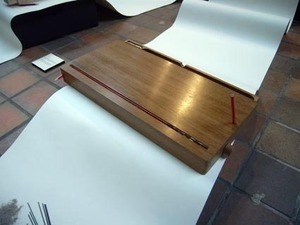 Although zero is essentially an immaterial concept, Nadine wanted to study it from a material basis – I’m guessing that this was to avoid falling into the trap of merely illustrating mathematical and philosophic concepts, but instead letting her design process embody the area of interest. Nadine went through many material investigations about how materials marched towards nothingness – how they degrade and sublimate. At the early stage she also looked at death and re-birth, which took her to a series of investigations into the semi-mythical 21grms (the mysterious amount of weight lost at the moment of death – i.e. your soul). She then dropped this as a direction. Nadine continued to experiment with materials that degraded, one of the material focuses for this was sellotape – which degrades under UV light. This is the point were she was most lost in the project; she was experimenting with materials but had no idea what it was she was designing (where it was situated, who is was for, what the material would do). This is where she started drawing. As many of you know I’m rather obsessed by drawing, I think it’s essential within the design process, not just as a means to represent something, but as a way to think, to create, to ideate. Drawing allows wonderful leaps of thinking that can move a project into new and unknown territories. This is the part of Nadine’s project I’d like to highlight (when she showed me her drawings I got tingles down my spin – yes, I really do get this excited about drawing). The first drawing shows her trying to find a context that has high levels of UV – i.e. 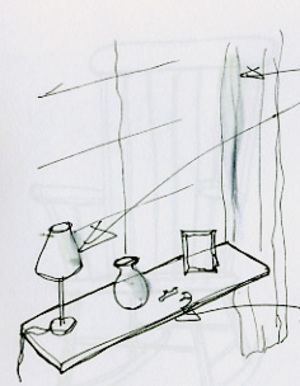 the windowsill in your home, the drawing presents a couple of objects commonly found on a windowsill - a lamp, a photo frame and a vase. 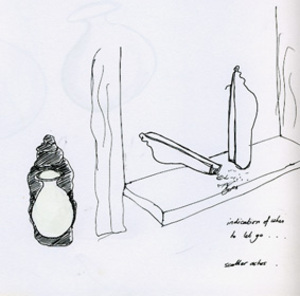 In the next drawing the vase becomes a highbred between vase and urn (due to its shape and position on the windowsill), it also has a split line that runs down the centre of the urn/vase made out of sellotape – with the passage of time the sellotape degrades and the vase/urn splits, becoming useless. It is here that drawing (in the hands of Nadine) does its magic, the ideas that had been influencing and intriguing Nadine came together in a tiny moment, but this was enough to accelerate her project. 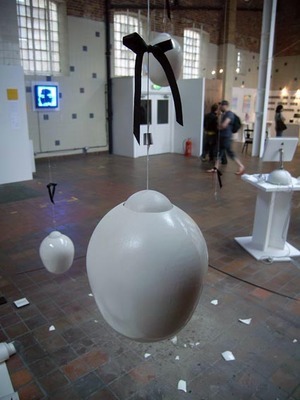 Nadine ended up designing three sets of memorials/urns for her final show. 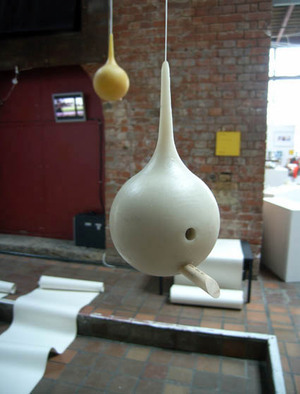 The first is closest to the initial drawing, it is called ‘Rest in Pieces’ and is a slip cast porcelain urn that hangs in tree, a thread biodegrades over a 2-3 year period, until the urn falls, smashes and scatters the ashes – leaving a small toggle with the initials of the deceased hanging in the tree. The second object is similar and is called ‘Bird Feeder’, a proportion of the deceased ashes are mixed with bees wax and cast into mould. Over time birds land on the perch (inscribed with the deceased name) and slowly eats the feeder, completing a rather disturbing (but beautiful) circle of life. The final object(s) is probably my favourite, because of its connection with drawing (if I die, I want this to happen to me!). ‘Carbon Copies’ is an urn/memorial in the form of a pencil case, the ashes from the body are turned into graphite (in the same way that they are for lifegem) and then made into pencils. An average size body makes approximately 250 pencils. The pencils are housed in an unopenable box that has a window to show the number of pencils left. As the pencils are used and sharpened, the box fills with the sharpenings (retaining all ‘left over’ elements). Nadine resisted designing the place of writing (the notebook, the diary etc. ), which on reflection is one of the real strengths of the project, this leaves the act of using the pencils open (what would write or draw with your loved one? ), retaining the individuals need to keep mourning personal and individual. One of the things that most impressed me most is the way that Nadine managed to negotiate a difficult and sensitive issue with grace, humour and poetry. hey, nice stuff, it brings to mind the work of jimmy loizeau, from the rca. See http://www.auger-loizeau.com/ for his project, (project name: 'afterlife'). His deathbed is particularly interesting, taking the acid from the stomach of the deceased, and using it in a battery to generate electricity to drive electronics. Life after death for the atheist..... nice one! Agreed. Some folks use push/pull, and some of this comes from the "permission markeitng" concept from Seth Godin from about a decade ago. I also agree with you that social media and the ability to have a conversation (like this one) change the game. So maybe we need a new term? You have some good points, and the best one might be that I prefer to debate less and do more marketing! If you are ever in Boston, look me up and I'll give you a tour of the HubSpot offices and buy you a coffee.